Five years ago, I was awakened by the phone. It was the day of my 30th birthday party - we had out-of-town friends staying with us. I assumed the early call had to do with the festivities. It was my dad. I will never forget the tone of his voice - calm, strong, yet gentle. He relayed the delicate news with clarity - becoming in that moment everything I had ever needed in a father. "Paige," he began, "The Lord decided to take Tiffany last night." I remember feeling confused (take her???) and then as the news began to settle in, it seemed almost logical. A co-worker at a social work agency had told me once that he, too, struggled with alcohol. "You get better," he said matter of factly, "or you die." Tiffany didn't get better. I have gone through the grieving gamet of emotions in the past five years and spent much of the first two feeling angry and annoyed. It is true that Tiffany spent many years struggling with addictions and depression; chaos seemed to surround her. But what about all of those other years? Shortly after her death, it was too painful for me to remember all of those years, but now I do. 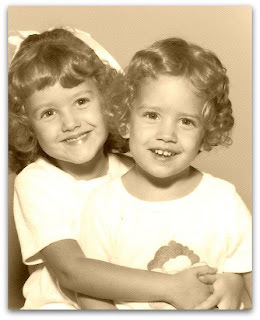 As I watch my own little girls play, I think of that silly, quirky, frizzy haired Tiffany. By my four-year old, I am reminded of Tiffany's physical energy - how when the weather got too hot to play outside she would run the perimeter of each room in the house or do handstands up against the wall - much like Isabelle jumps repeatedly from couch to chair and ends with a sommersault. By my little one, I am reminded of Tiffany's desire to please and to make people laugh. I keep picturing her dressed up as a "hobo" - kleenex stuffed in her mouth to change the look of her face (think Marlin Brando in the Godfather) ringing our front doorbell and pretending to be a "stranger." Isabelle told my husband and I that we couldn't die because we were, "too real." When I think about Tiffany now, that's how I feel, too. I remember the way her skin smelled, her crooked little teeth, and her shy smile. She seems too real. Ironically, I had a funeral to attend this morning. As I sat watching the young girl whose boyfriend (and baby's father) was tragically killed in a car accident, I felt nauseus thinking about the days, weeks and months ahead of her. Death hurts so bad. I began to wonder who would be next in my own life and how I could bear it. Oh God, how? But as I sat there thinking morbid thoughts, the Paschal Troparion began to play in my head - every word a response to my question. "Christ is risen from the dead," it whispered, "trampling down death by death and upon those in the tombs bestowing life." I am beginning to realize that we do not sing this over and over because it's pretty, but because the resurrection message is the answer - and if we believe it, there is peace - especially - in the pain of death. What a sweet picture of the both of you! These are such beautiful thoughts about your sister and your feelings about her. I really appreciate you sharing them...memory eternal. Sweet Jen - Thanks for comments and feedback. Love you. i had to wait until today to read this as yesterday would have been too hard for me...it was not easier today. but i enjoyed it anyway. i love hearing the good memories of our sister. i would write a whole book on all of the good things about her if i could. sweet, funny, simple, and tons of joy...that is how i like to remember her. i missed you yesterday, and wish you could have been with us. i love you and thank you for sharing this. Thank you for this post. It is beautiful and heartbreaking and hopeful and you are an incredible writer. Thank you for the gift of letting me begin to know Tiffany, too, through this post.